Junior veterans affairs officer badge stickers are customized for your U.S. Veterans Affairs department or hospital. 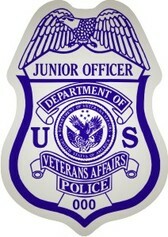 Junior officer badge stickers are ideal for awareness, community events or educational programs. Junior veterans affairs officer badge stickers are printed on your choice of glossy white, shiny gold foil or shiny silver foil label stock. #VA-15 STICKER SIZE: 2-1/8" x 3"